Treat your body with Dove Invigorating Avocado oil and Calendula hand cream, inspired by rituals from women in Central America. Dove believes in real beauty solutions inspired by real women around the world, we took inspiration from traditional rituals in Central America to unlock age old beauty secrets to provide the best skin care for you. This moisturising hand cream with Avocado oil and Calendula quickly moisturises the skin to offer an instant solutions to rough, dry skin. The fast absorbing formula allows the hand cream to instantly moisturise and soften your skin, whilst the fast drying formula ensures there is no sticky or greasy residue. Dove Invigorating Avocado oil and Calendula hand cream has a fresh, clean scent to lift your senses and achieve a truly replenishing sensation. And the result? Say goodbye to dry skin, your skin feels deliciously smooth and supple. This product is specifically designed for dry skin. For the best results apply daily after washing. Apply body lotion after washing to ensure moisture is locked in to achieve the best moisturisation for your skin. Dove Invigorating Avocado oil and Calendula hand cream offers both replenishing care for your skin and a soothing scent to unleash a full sensory experience. Dove Invigorating hand cream has been dermatologically tested. 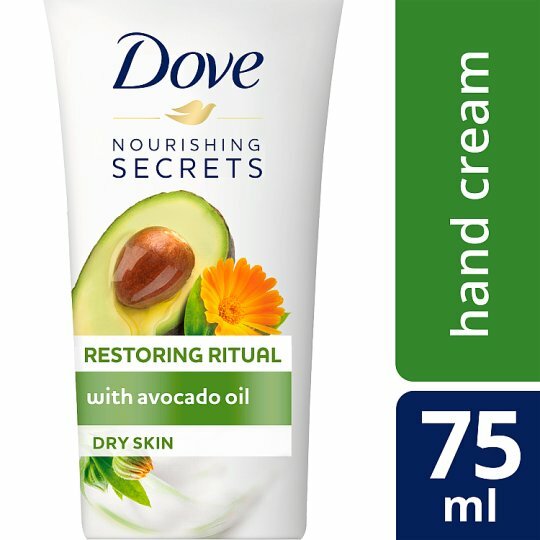 Treat your skin with Dove Invigorating Avocado oil and Calendula hand cream, inspired by rituals from Central America. Can be given as the perfect gift for her. Also make sure you try our Dove Nourishing Shampoo range.